Most people use Adobe Photoshop or Adobe Elements as their photo booth template maker. These apps are great, however they can be overkill for someone who only wants to simply create photo booth templates and doesn’t want to be be bogged down with excessive features. The good news is Adobe Photoshop & Elements are not the only options you have when it comes to making photo booth templates. Some photo booth software include photo booth template makers and there is also an app that is built specifically as a photo booth template maker. Paddee is the app we sell here at getpaddee com. Paddee is the only app on this list that is 100% a photo booth template maker and focuses only on this one task. All the other apps are photo booth software that have built in photo booth template features. Paddee online marketplace and editor for photo booth templates. 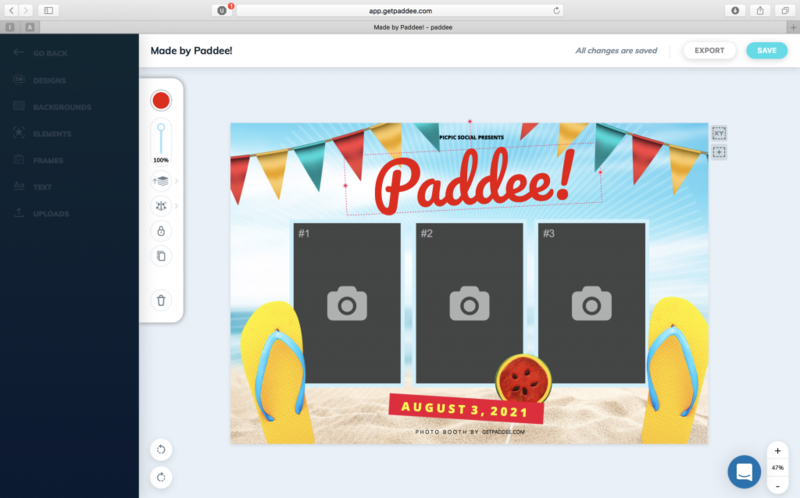 With Paddee you can browse photo booth templates in the marketplace. When you see a design you like, you can edit the design from your web browser, without using Photoshop! Paddee is built for photo booth companies but is also used by DIYers hosting events with their DIY photo booths. 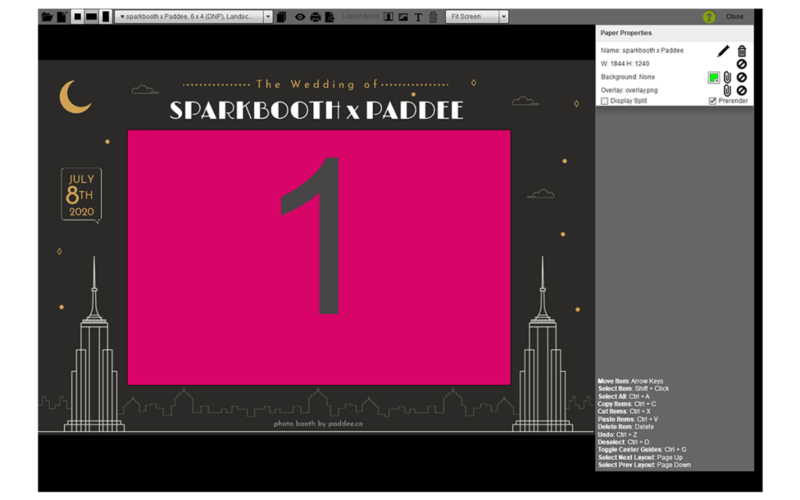 Paddee templates can work in 99% of all photo booth software out there. Cost: Paddee has templates starting as low as $3 per template. 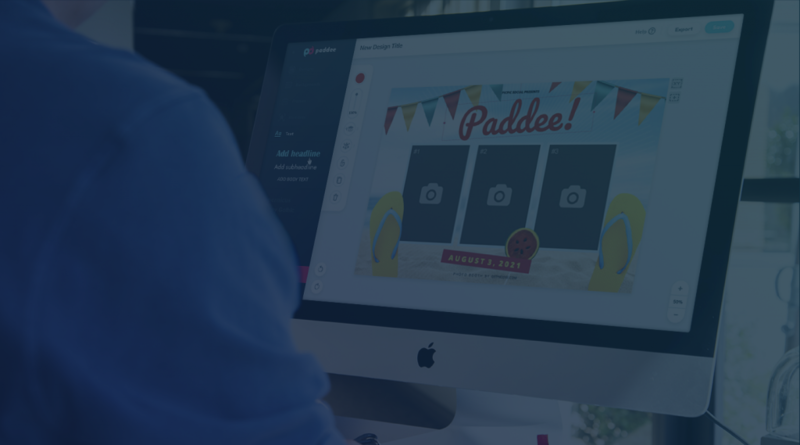 Bottom line: Use Paddee if you want a turn-key photo booth template system that gives you constant updates and allows you to embed a template library into your website. Darkroom Booth is a software that prides itself on ease of use and customer service. Darkroom Booth is one of the easiest Windows based photo booth softwares to learn and it’s got an incredible support team to back up their software. Darkroom Booth includes photo booth template making tools using the built in designer in the photo booth app. The Darkroom Booth template editor gives you full control to build a photo booth template from scratch or start editing one of their 25+ templates that come prebuilt with the software. If you are running a Mirror Booth using Darkroom Booth you can add the signature location to the design as well as barcodes for your clients. Bottom Line: Dark Room offers a basic editor that lets you do cool things if you want to take the time to learn it. Once your build templates with DRB you aren’t able to use these designs in other software easily. dslrBooth is one of the most beautiful and easiest to use photo booth software available. 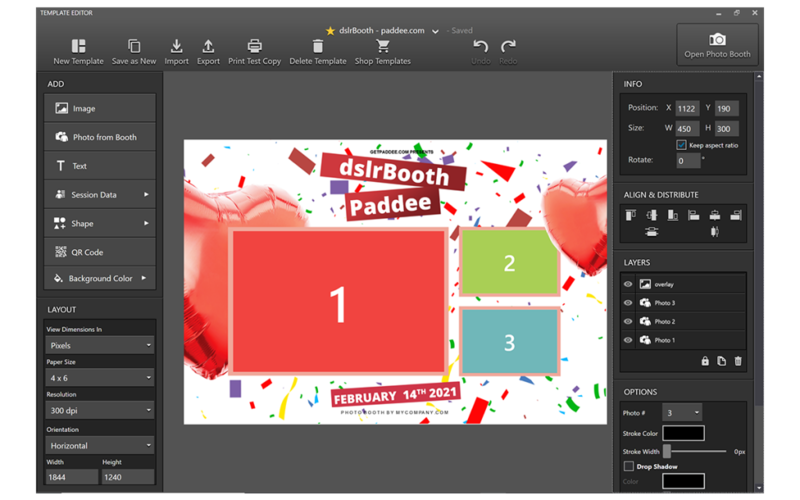 dslrBooth has been a pioneer, being of the first photo booth softwares to include a photo booth template maker as a built-in feature. The dslrBooth photo booth template maker is dead simple to use. It allows you to create photo booth templates using only dslrBooth and no other tools. You can add graphic files saved onto your computer, add shapes and custom text. The dslrBooth photo booth template maker also allows you to add “session data” from the photo booth session to the photo booth print. This nifty feature allows you to put custom information on the photo booth prints like QR codes, signatures (used for mirror booths) and survey answer and more. dslrBooth doesn’t come with any built in templates so you’ll need to create your photo booth templates from scratch with dslrBooth. However, dslrBooth has a template marketplace where you can buy templates for $15 per template. Cost: dslrBooth pricing starts attacking $59. Each of their software versions includes a photo booth template maker. Spark Booth by John Wu has come a very long way since its first inception! I think Spark Booth is one of the first photo booth apps a lot of first time boothers started using and when it came out. It was the only one that was easy to use and worked really well. Fast forward to 2017 and Spark Booth is one of many easy to use photo booth apps. Spark Booth boasts a strong user base and excellent support via their online forums. Spark Booths photo booth template maker gives you everything you need and nothing much else. You can import clipart and stock photos you find online and you can add placeholders for where your photos taken with Spark Booth should go. Spark Booth includes blank templates but doesn’t include fully created designs that are ready to use. Cost: To get the photo booth template maker in Spark Booth you will need the premium version which is $119. 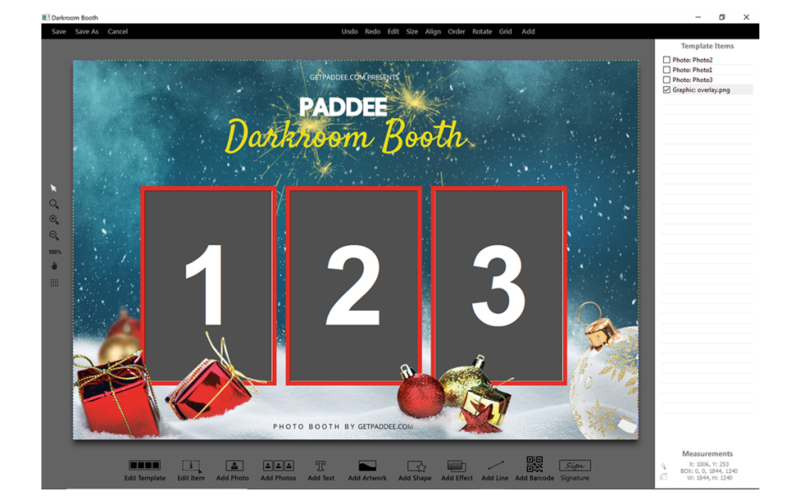 If your goal is to not use Photoshop or Elements to create photo booth templates, your best choice is to use Paddee. Paddee being a 100% photo booth template maker, it has more features than the photo booth software that only include a limited photo booth template maker. Paddee gives you a template marketplace with over 500+ templates you can design from your browser and a Look Book. You can embed the Look Book into your website to allow your client to find a template for their event without you spending time going back and forth on designs. If your goal is to only use your photo booth software for photo booth templates, you should stick to the software you currently use if it includes a photo booth template maker. None of the photo booth softwares are worth switching to only for that feature alone. However, if you don’t already have a photo booth software and Paddee doesn’t do it for you, I would suggest you go with dslrBooth if the photo booth template maker is your highest priority.